HUMBOLDT BAY – Just over 12 weeks since two eggs hatched a pair of little “bobblehead” baby eagles, eaglets Kyle and Stormy are flying on their own. The pair, who, with their parents “Mr. and Mrs.,” have gained a large following on the Humboldt Bay Eagles online cam, are expected to leave the nest for good and fly off soon, possibly within days. The hardy pair are developing normally, thanks to excellent rearing by the experienced mother and father. The parents’ age isn’t known, though they have produced as many as eight offspring so far, and could continue to do so for another 20 years. For now, the kids are “hop-flying” to nearby perching spots in other trees within a hundred feet or so of the nest. “They need to build their muscles,” said Sandra Hunt von-Arb, a wildlife biologist who has been assisting with the eagles. The eagle family’s health and fecundity has a lot to do with Humboldt’s vibrant and diverse ecosystem, which provides a steady supply of food. The eagles’ online fans delight in documenting the parents’ daily deliveries of prey to the nest. Coots, gulls, skunks, ducks, fish and other hard-to-identify animals are enthusiastically received and devoured by the ever-hungry eaglets. “They have a good food source and not a lot of competition,” Hunt von-Arb said. “They aren’t having to compete with other eagles that are compressing their territory,” Campbell-Spickler said. Not spending a lot of energy fighting off competition for the food items has helped the family get the young ones a good start in life. Dubbed “Scrappy” by online fans, a young eagle perhaps one or two years old has taken to visiting the nest and helping itself to family meals. Theories abound as to Scrappy’s origins, and it may be related. “It might be an eaglet from last year,” Hunt von-Arb said. “There’s no way to verify that. 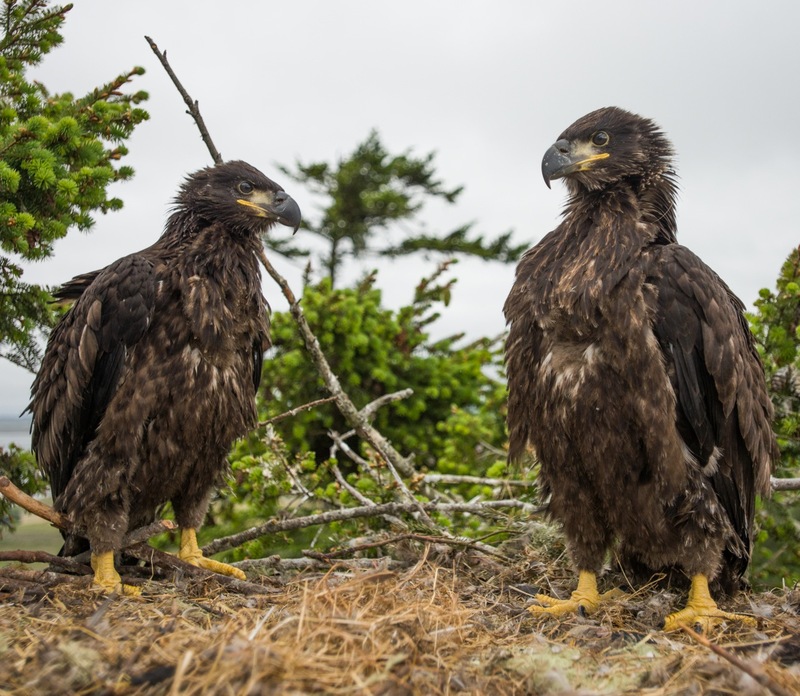 Within days, the young eaglets will likely leave the drama behind, along with a lot of teary-eyed followers. They may then mingle with offspring from other nesting pairs in the area, located on south Humboldt Bay, the Mad River, Redwood Creek and Orick. But the Humboldt Bay Eagle enthusiasts are looking forward to next year, when a new, improved camera with night vision will have been installed. The improved views will likely reveal still more dimensions to the avid eagle-watchers in Humboldt and elsewhere. “Eagle society is so much more complicated than we ever imagined,” Hunt von-Arb observed. This entry was posted on Wednesday, August 7th, 2013 at 2:37 pm	and is filed under News, Animals, Environment, Technology. You can follow any responses to this entry through the RSS 2.0 feed.